Because Today I was killed by a drunk driver while I was helping push a disabled car off the highway. Today I was shot and killed during a routine traffic stop to simply tell someone that they had a taillight out. Today I was killed in a traffic accident rushing to help a citizen. Today I was shot and killed serving a warrant on a known drug dealer. Today I was killed by a man when I came by to do a welfare check because his family was to busy. Today I was killed trying to stop a bank robbery or a grocery store robbery. Today I was killed doing my job. A chaplain and an officer will go to a house and tell a mom and dad or a wife or husband or a child that their son or daughter or husband or wife or father or mother won’t be coming home today. The flags at many police stations were flown at half-mast today but most people won’t know why. There will be a funeral and my fellow officers will come, a twenty-one-gun salute will be given, and taps will be played as I am laid to rest. My name will be put on a plaque, on a wall, in a building, in a city somewhere. A folded flag will be placed on a mantel or a bookcase in a home somewhere and a family will mourn. 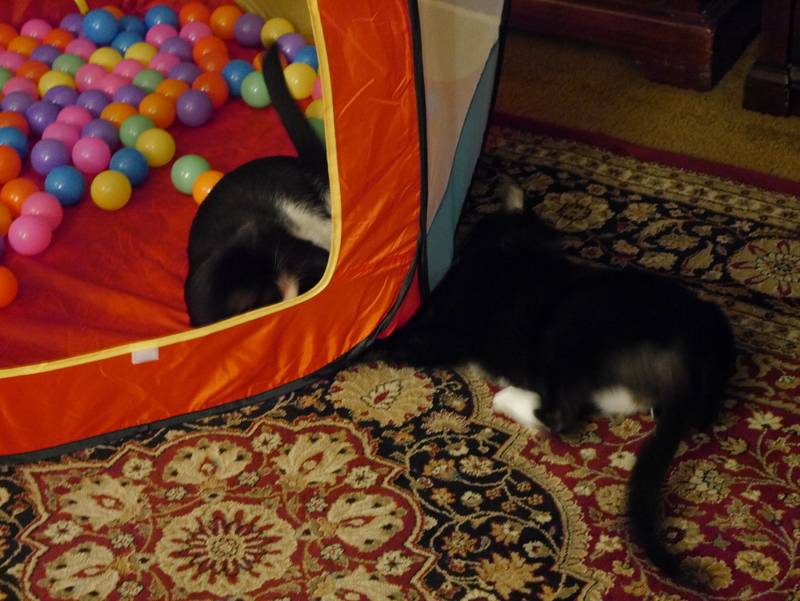 The kitten is too feisty for our older cat and wearing her out and her nerves have given way to obsessively licking herself much to the dismay of her fur . . . She’s actually worn patches of it away! Our solution? 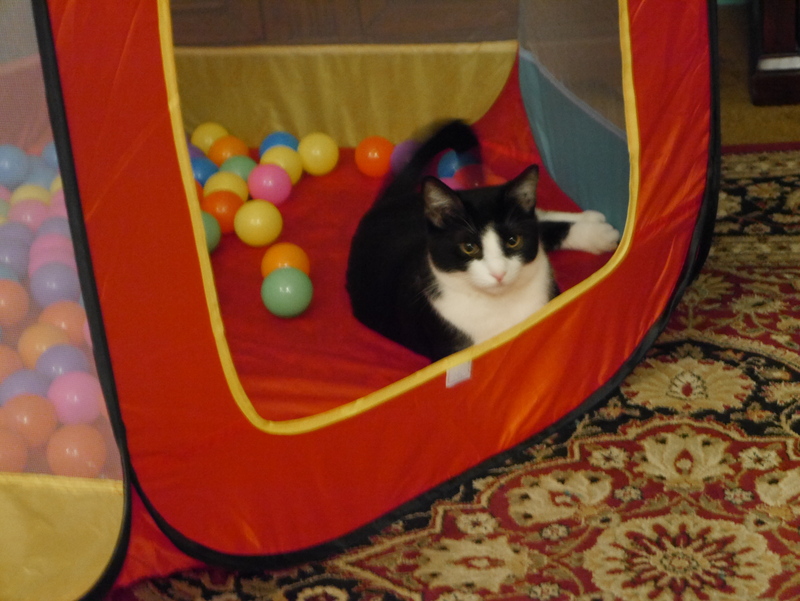 A ball pit which is actually supposed to be for babies but we have baby-sized cats, right? Marcella (with the purple collar) isn’t sure about it but Buster has claimed it as his own. See the ‘lip’ around the front of the entrance? 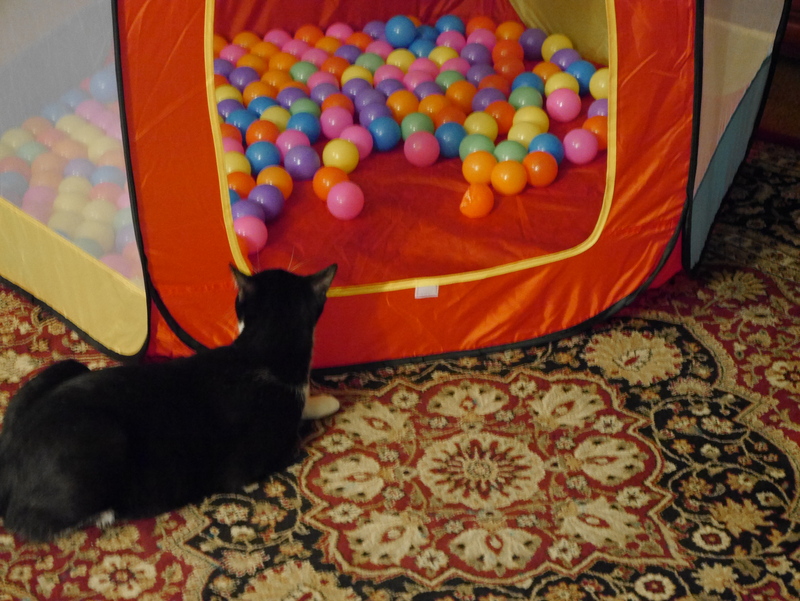 It is supposed to keep the colorful balls within the confines of the ball put . . . Buster has proven this to not work. Justice System in the US – Will It Apply to Everyone? Priorities – Birds Or Babies? Is Jesus YOUR Lord and Savior? I’ve made friends from many religions other than my own over the years. Usually, we enjoy each other’s company and respect each other’s beliefs. One thing many of the Protestant faiths often bring up and ask is, “Have you accepted Jesus Christ as your Lord and Savior.” Since this was never expressed in any of my Catholic catechism lessons exactly like that, it always made me think for the moment and then mentally shrug, and go on with my day. Recently, I viewed the movie, War Room, and in word and action, the theme was accepting Jesus Christ as the Lord and Savior. Although all Catholics do/should feel this way, we don’t often hear anyone exclaiming it to anyone that cares to listen. It does make sense, however, to add this thought or feeling to our prayer life and attitude towards life. Jesus came down to earth to be our Savior so we are accepting him as such. Why not say it? I don’t mean going around and unexpectedly bursting forth with this to strangers on the street but the thought of prayerfully stating this in our own daily prayers, could be a reminder we might have been overlooking a bit and not giving it the merit of joy it should constantly provide us. Another thought popped up in my friend’s and my impromptu conversation as we wondered how come it seemed that other religions put more thought in their attire in attending their Sunday services whereas way too many Catholics come in the clothing they could wear for shopping or a picnic in the park. My young friend thoughtfully said, “Perhaps, the Protestant faiths dress up because they constantly remind themselves that Jesus is their Lord and Savior and they want to worship Him in attire that is respectful of His presence in life especially during time of worship.